The Temple of Zeus was created in about 450 BC by the renowned Greek sculptor Phidias. He us the same artist who created the famed statue of the goddess Athena for the Parthenon in Athens. 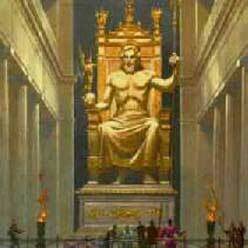 Zeus' seated figure (see picture) was 12 meters (50 feet) high. The head nearly scraped the ceiling of the Temple of Zeus. Phidias wanted to emphasize Zeus's mightiness. Zeus' body was ivory and his robe, hair and beard, gold. The throne was cedar inlaid with precious jewels. Zeus's outstretched right hand held a small statue of Nike, the goddess of victory. The Statue of Zeus was inside in the 64 meter (210 foot) long Temple of Zeus, which could be called a wonder on its own merits. The 72 exterior Doric columns of this Seven Wonder made a stunning architectural statement. And, its pediments and metopes were ornamented with outstanding sculptured artwork.